Health Care Tax on Real Estate Sales? Maybe you’ve received the e-mail making the rounds these days which states “Under the new health care bill – did you know that all real estate transactions are now subject to a 3.8% sales tax?” Of course I was alarmed because a tax on real estate would be just one more blow to the economy, as real estate contributes 32% to our nation’s GDP (Gross Domestic Product). Upon searching factcheck.org I discovered this is partially true. According to factcheck.org “Democratic lawmakers decided on a new 3.8 percent tax on the net investment income of high-income persons.” They go on to write that the law is misleading, and it would be easy to see why anyone reading it would believe the 3.8% tax applies to everyone that sells a home. So the circulating e-mails may not have been intentionally misleading or malicious. Furthermore, the 3.8% tax won’t apply to everyone. It will apply only to profit on the sale of a home exceeding $250,000 for a single person or $500,000 for a married couple filing jointly. There are some minimum income requirements too. The tax is not scheduled to go into effect until 2013, after the next election. We are not tax professionals, so we encourage everyone to consult with their own tax advisor. It appears that Congress and the President have snuck in additional capital gains taxes on real estate. It is easy to see why this fact has not been advertised because it is not very popular with Americans right now. Median home prices are up over 9% from last year, but they did take a step back in May, down 4.53% from April’s numbers. The median sales price of a home stands at $96,900, down from $101,500 a month earlier but up from $87,900 last year. Home sales remained strong in April with 1,460 sales in May, which was up over last year’s 1,417 number. We have noticed a drop in pending sales in June. We know that many sales have been delayed or fallen out due to the flood insurance expiration. Congress has not renewed the National Flood Insurance Program, so essentially it’s impossible to get a mortgage on properties that require flood insurance. One tactic people are using is buyers assuming the sellers existing flood insurance, if it exists. You cannot do this with hazard insurance, but it can be done with flood insurance. We’ll keep a close eye on the SW Florida real estate market going forward. Oil has not hit here, and as we wrote last week, there are scientific reasons why it may not ever. We have lost one sale from a buyer who definitely wanted to buy a waterfront home but is waiting to see what happens with the oil spill. Between the oil, flood insurance, tax hikes, expiration of tax credits, and the like we’d hope that our government would be more proactive in stimulating real estate activity, because we know real estate sales stimulate the economy. At the very least, renew the flood insurance program and eliminate tax hikes on sales so people who want to purchase can again. Here’s an update to our SW Florida Real Estate Video Channel. The Top Agent channel has received 1,661 channel views and the videos have received 29,940 views. We have videos posted other places, so this is just the videos contained inside this channel. WINK News 5 13 09 10PM-Local Housing Rebound? Ok, we have many more videos but you get the picture. Subscribe to our SW Florida Real Estate channel and browse away. Will Oil Affect SW Florida? That’s a good question, and I guess the answer depends on which facts you believe. In the beginning we were told the spill was leaking about 1,000 barrels per day, and just this past week we’ve been told it is now 35,000- 60,000 barrels per day, which translates into 1.5 million gallons to 2.5 million gallons per day. The truth is BP hasn’t been very concerned with educating us on the true facts nor the scope of the problem in the Gulf. I’ve been watching a lot of TV on the issue and reading articles and it appears that many experts believe SW Florida is located in what they call a “Dead Zone, or Forbidden Zone”. This is a confusing term because they also call the panhandle a dead zone because of the impact of oil and its effect on wildlife caught up in the oil. 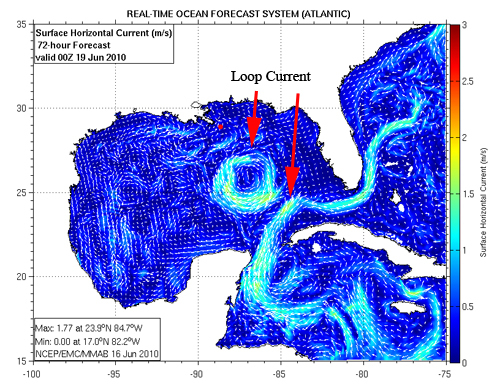 The “Forbidden Zone” they refer to in SW Florida has to do with currents, and the fact many experts believe SW Florida will be protected by these currents from the oil. In fact, Dr. Jeff Masters who created Weather Underground wrote a blog article on how SW Florida is protected. He writes “the west coast of Florida from Tampa Bay southwards to the Everglades is at minimal risk of receiving oil from surface currents. It appears the ocean side of Key West as well as the East coast of Florida is at more risk than SW Florida due to the currents and land configuration. So is SW Florida completely safe from oil? That answer is probably not. There is still a risk of a hurricane or tropical storm blowing oil into SW Florida, although not likely. Most likely a tropical system would help blow oil away from SW Florida. Dr Masters also writes that the protection in the “Forbidden Zone” only holds true for surface oil, and if in fact there are underwater plumes, this oil could get caught up in the Loop Current and could make its way anywhere really. Again, more likely would be the sensitive areas of the Keys and up the East coast. The larger risk to SW Florida is the “Perception” that oil has hit, and this affects tourism and the economy. News reports indicate hotel bookings are down across the state as many people believe oil has hit, or will hit very soon and they’re afraid to book travel. The Reality is oil has not hit anywhere close to SW Florida, and likely will not anytime soon, if ever. Of course, misleading facts from BP and the government do little to soothe people’s fears, so their perception becomes their reality. The reality is oil may not ever come here. The reality is oil has already hit other places, and likely will hit more places. Once word reaches out that SW Florida has been unaffected, other places loss could become our gain. My gut tells me nobody wins though, as tourists tend to shut off and believe the entire state is under siege. It’s possible in the future tourists will want to go where there was no oil, and that could become a future selling point for SW Florida down the road. In the meantime, I think we just need to keep the word out that the oil is not here, is not close to here, and our beaches are safe and a fun place to vacation. SW Florida remains home to fantastic fishing, awesome beaches, excellent real estate values and a high quality of life. It’s been a little while since we’ve reported on inventory levels and pending sales in SW Florida. 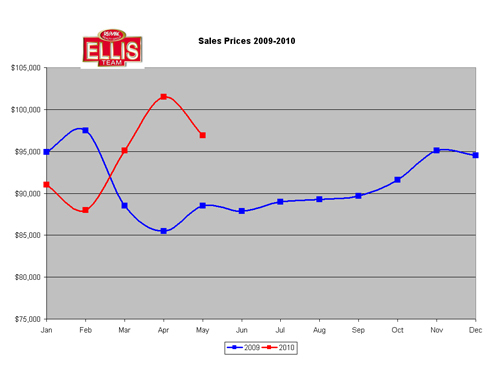 We’ve been reporting on record sales levels all of 2009 and into 2010, and increasing prices the past few months. So how has this affected inventory levels, and how are pending sales doing which reflect future sales activity? 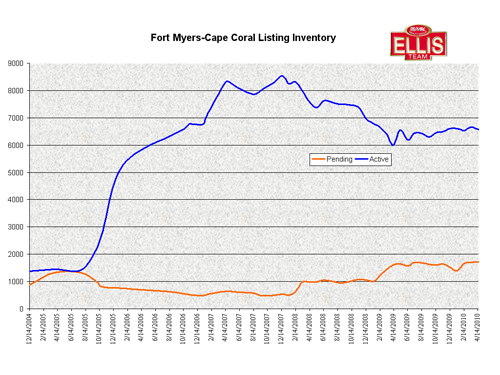 Enclosed is a chart that illustrates Fort Myers and Cape Coral inventory levels over time. It does not include the entire county, and while countywide numbers would be higher in total, the graph looks very much the same. As you can see, back in 2005 we had about as many pending sales as we did active listings in MLS. We all know what happened about September of 2005, and the graph perfectly illustrates this. By tracking these numbers it was easy to predict what was going to happen in 2006. Then something happened again about December of 2007. We noticed inventory levels peaked, and within a few months pending sales picked up steam, an indication the market was on the move again. Since February 2008 we’ve seen a steady increase of pending sales, and this has led to much higher sales levels in 2008 and record sales levels in 2009. Sales activity has remained strong in Fort Myers and Cape Coral. We have noticed a decline in foreclosure properties entering the market, and also an increase in short sale closings in SW Florida. Normal sales have also increased. 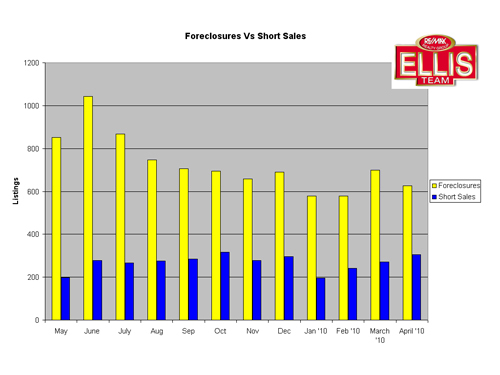 Total distressed sales declined in April from March, while all sales increased slightly. So what does this all mean going forward for SW Florida? That’s an interesting question. One would think prices would continue to increase, and this is a distinct possibility. We wouldn’t be surprised to see a slowing in actual sales as prices rise. Prices today are still near bargain basement prices, but a dwindling foreclosure supply may lead to higher prices. As we see higher prices, investors will either be more motivated to scoop up everything they can, or less motivated because properties won’t cash flow as easily, and future capital gains are lessened with each price increase. This leads us all back to first time home buyers, move-up buyers, and vacation or 2nd home buyers. We don’t see many move-up buyers today, presumably because local buyers don’t like the sales price they’ll receive, even though they love the new price on a home they may be seeking. We also don’t see a lot of confidence in the local employment market. We believe jobs will ultimately fuel real estate growth once we move past these bargain basement prices, and it is for this reason we could see lower sales volumes as prices rise. We probably won’t see a full blown real estate recovery in SW Florida until the economy improves and jobs return. The answer to this situation is likely the answer to the previous question. Our local real estate market is riding the wave of investors and northerners looking for their piece of sunshine at sale prices, but once the sale is over, this wave will only last so long, and this is why we’ll need job growth to sustain the recovery after this wave. Inventory levels have been holding steady, and buyers have been ready, willing, and able to absorb the entire inventory the banks could throw at the market. It will be interesting to see if buyers are willing to absorb more now that foreclosures are slowing down. This will be an interesting supply vs. demand match, and we’ll report back on which side takes the upper hand.